Okay. I've set up my page. Who knows where we'll go from here. My student that is also currently in AP Calc stayed after to meet with Mr. Owen, the Calc teacher, so when she stopped by on her way out from his class, I knew my guinea pig had arrived. "Hey, you're just in time for your blog." "Yeah, I just set it up. 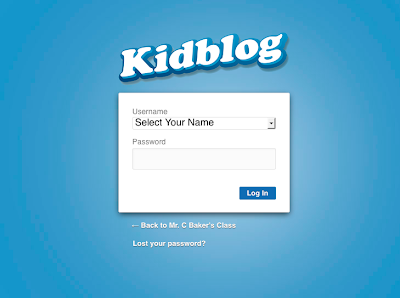 Let me just figure out how to log in now..."
"Sorry its KidBlog - it was the only site I know would let me set all this up for you guys. I mean, its demeaning to me..."
"It's fine... I've never blogged before. I'm not interesting. I won't have anything to say." "Oh, don't worry about that - I'm going to give you prompts for now." We'll see what J comes up with this weekend. She's usually willing to try most anything (if she's sure I'll get around to giving feedback on it). Where I'm sitting now on the direction I'm going to steer my kids' blogging is to relevance. (which was one of the options I came up with previously) They always want to know, so here's their change to get it. And share what they find. I'm going to stress much more on research process in the writing than a "right" answer about relevance. What do you think about my prompt? How would you help me improve it? I agree that for this year, I was mostly just seeing what I could do with it. I was thinking about using it during summer school, but is it worth it for 2 weeks, you think? Since she was doing this as a pilot for me, (and she is in like 5 other AP or honors classes) I told her she could get it done whenever she had time (which I knew would be soonish given the timeframe she made an ebook for me in a similar scenario). I assume by "making it their own" you mean making it a place that they write for themselves and even when unprompted, right? Honestly, I can't even really see that happening as strictly a math blog. I get bored talking about one subject myself on here. Here's another place where our classrooms differ - your kids could legitimately write related to class on any subject. The math TEACHER blog community is pretty small itself - I have a hard time imagining the size of the audience for a math student blog. The only possible redemption - they use the blog to explore THEMES of interest related to whatever we're doing in class at the time? Visually, I like that it's a separate window from the text, it sets it apart and makes it the star. Not sure I like the photo of the handwriting - especially since part of it's cut off. I like the idea of handwriting being displayed in a post, as a wordless reminder that I am indeed a human, but when I want handwriting I like to use Smart Notebook + wacom pen. Math-wise: It sounds challenging, which is probably fine for the kids you're describing. It's also a big task, and it seems like it will take them a good while to do it. If it were my kids, and I wanted them to do something this involved, I would have to give more guidelines, including how long the description has to be, does the video count as the description or should it be accompanied by text, etc. -I got a lot of reflections from them via a googledoc spreadsheet that only I could see, then I shared their reflections publicly on the classblog, anonymously. Then I made them all read and comment about which reflection they identified the most with other than their own. Got them to see that other peoples' ideas are interesting to read. Relevance: I so agree with this! I want them to fall in love with writing about their own journey in learning as I have, but it has to be relevant to THEM! I am finding that it is a tiny minority of students for whom this happens. Last year I had 3 who blogged whether or not I asked them to, and this year I have 2. Maybe the stats amongst teachers who blog are the same? Finally, just do it! Who knows what'll happen? I still don't know where I'm going or what I hope they'll get out of it, other than better learning, self awareness, and digital literacy. 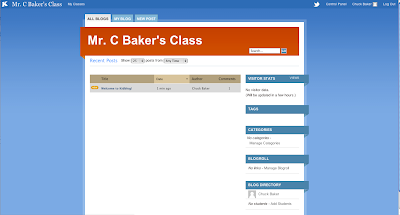 You might want to check out the brilliant Crystal Kirch's blogpost about her class blogging ideas, too. 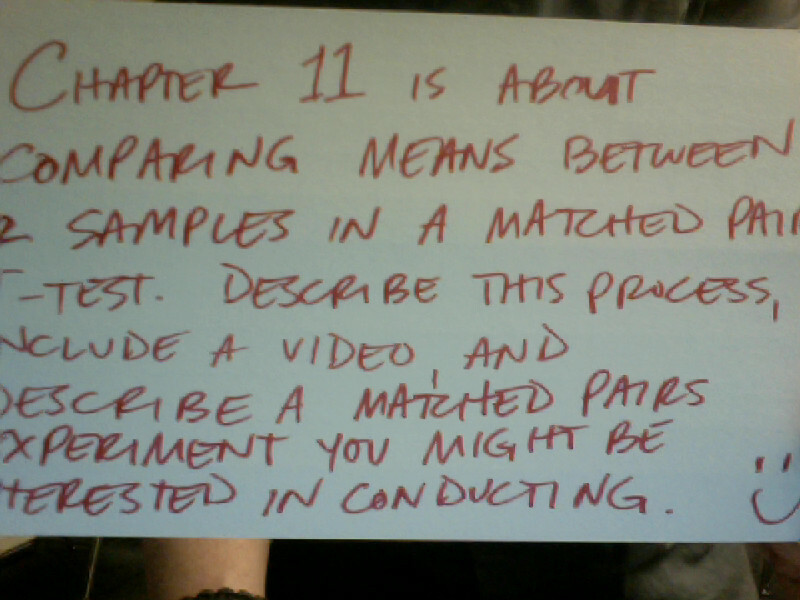 As far as the prompt itself, I just took a picture of the index card I gave to the student as she left. For a class-wide prompt, I would write it out more formally, given more guidelines and probably post to my class google site or our shared dropbox folder. Love your strategy for commenting. Definitely going to do that if/when I roll this out larger next year. How classes/ages do you blog with? I have three grade 11 classes, all math, and they're all set up with their blogs linked to the classblog hub. In my first year, we were all on the same blog, and anyone in the class could post to it. I used the scribe post strategy then, which at first was exciting and new, but I was the main and only reason anyone ever posted, because I assigned it to different people. Plus after a while I noticed that each of their posts got slowly buried by the scrolling, and there was no opportunity for them to have their own place that they could customize. I still don't feel like there's enough excitement, maybe what I need is to partner with other schools, like a quad blog type of thing....next year maybe!